It seems to have taken until the eleventh hour, but Disney has finally found a way to make its classic fairytale stories work in the 21st Century. Thanks to longtime Disney animator Glen Keane (serving as producer) and directors Nathan Greno and Byron Howard (“Bolt”), the film stays true to Disney’s long line of rich fairytale history while adding a distinct layer of action, adventure and humor that modern audiences now require. 2009’s “The Princess and the Frog” marked a complete return to traditional animation for Disney and received much praise, but the film continued the trend of moderate and unsatisfactory box-office success for fairytales. All hope seemed to be pinned on “Tangled” to revive the genre or it would surely hit Disney’s back burner indefinitely. Once titled “Rapunzel,” Disney’s strategy for this film was clear: appeal to a wider audience. Zachary Levi’s character Flynn Rider, a sharp but self-absorbed thief, became a focal point of the marketing, and while this is Rapunzel’s (Mandy Moore) story, he does play a more prominent role than a large segment of Disney princes from over the years. In short, “Tangled” appeals to boys, girls and the whole family. Disney has never been known for defying stereotypes, so in that sense, the complexity of Rapunzel and Flynn should be a lauded accomplishment. Like most princesses (or so it seems) Rapunzel is a naive dreamer who sings about longing to see the outside world from her tower, but she’s quick with a frying pan (as a weapon, not cooking utensil) and her hair possesses a surprising amount of dexterity. It’s rather unrealistic how well she handles the outside world considering her overprotective and narcissistic mother (Donna Murphy) has bred incredible fear in her, but she’s by far the most 21st Century princess to date. As for Flynn, despite the cockiness, deception and excessive charm, he has a down-to-earth dry wit too that makes up for his over-the-top nature. The story carries a surprising amount of intensity and emotional pull. With Mother Gothel and the two thug twins in pursuit of Rapunzel and Flynn as they venture to the kingdom so Rapunzel can see the “floating lights” that come out every year on her birthday, there’s no shying away from dark elements. The possessive mother motif always works to make you sick inside and considering Rapunzel’s sweet nature, you really do wish ill on Mother Gothel. 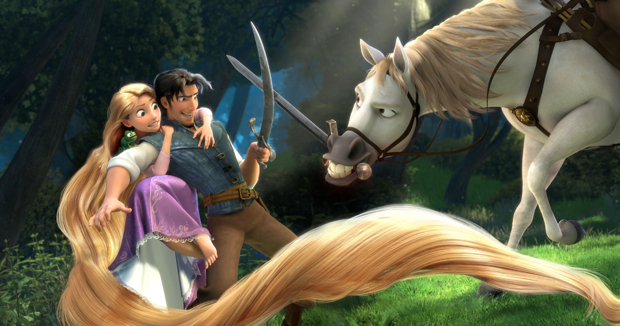 In terms of the animation, “Tangled” feels traditional, but it’s a good thing. Keane has worked on countless of the Disney classics of the ’90s and he finds a way to adapt that style while using computers. The result is that familiar richness and magic of a hand-drawn animated film with the photorealism and attention to detail of CGI. With big round eyes, all the characters earn our sympathy quickly and make “Tangled” as enchanting as it is action-packed and exciting. As Disney has always done with exceptional skill, the non-verbal but human-like animal characters vastly increase the humor of the film. Paschal the chameleon and Maximus the royal steed both have unpredictable dispositions that make them fun and lovable. As a chameleon, Paschal likes to instigate conflict but quickly recoils and turns the shade of objects around him when he’s nervous. Maximus takes it upon himself to track down Flynn with a sense of self-importance, yet he’s a sucker for normal animal pleasures like being pet and apples. The brilliance of these characters never fails and will always be part of the Disney legacy. So sigh relief if you’re a Disney fairytale fan, because “Tangled” has finally found the answer. Some die-hards will insist on more memorable songs and musical numbers (even with a couple of excellent Alan Menken tunes, especially “I See the Light”), but the trade off (as seen with a “PG” rating for the film as opposed to all previous fairytales earning a “G”) is something more compelling for all audiences.